Purchased a wood kit from fordwood and the plans from Leon Parker. The old wood sills have been replaced with 2x4's I have looked at a rewooding project in the 2010 forum but did not give much info. here is a picture of the same metal piece and pillars that is in my 23 runabout. I hope you aren't using pine. Much to soft and will easily split.The front seat kick panel will give you the proper width at that point, as will the rear seat panel.Don't be afraid to cut a shim or two and use them to pry a post out if necessary. I have found them in original bodies. Jack Daron, I believe the wood that Fordwood uses is Ash. I have studied the above picture and just can't seem to get the dash pillar far enough out when it is screwed to the floor board riser. Loosen screws at bottom and pull it out.That will give you some idea of how big a shim is needed. Once you get it,then tighten screws back down. It isn't that hard. Thanks for the tips. Going to try again this weekend. Please check your e-mail (possibly the spam folder). I sent you a copy of RV Anderson's 1923 low cowl roadster rewooding article to your profile e-mail address. Ash works just fine. I have yet to see any splits in the ash sills on my huckster after about 10 years. I have built 2 T's using Fordwood kits. A 1919 Runabout and a 21 Touring. In my 24 Coupe I bought some ash pieces to replace some structure wood pieces. As for as the Fordwood kits are concerned the wood didn't split or crack and it nailed just fine. I believe it was mostly ash. The ash Coupe pieces worked fine also. No splits or etc. Thank you all for the tips. Should help me get it right. And thanks to Hap Tucker for sending the article on re-wooding a 23 low cowl roadster, which is what I have, and the other links. Worked on getting the pillars installed at the right angles. 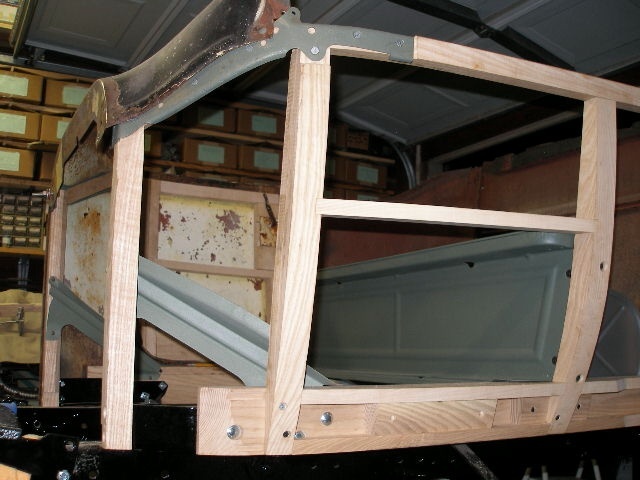 The best tip was install the pillars and the metal brackets in the sheet metal, then putting all the pieces on the sill. The only thing is, you should have the front pillar installed so you can clamp the sheet metal to it and then the seat riser clamped in the metal so you can then clamp it to the sill. Worked like a charm. Again, thanks for all the tips and advice. No splitting of the ash, just need a small pilot hole.